Triceps brachii seen from behind. 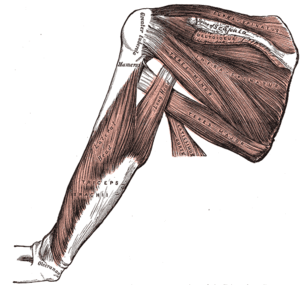 Triceps brachii seen from behind. Three different colors represent three different bundles which compose triceps. The long head arises from the infraglenoid tubercle of the scapula. It extends distally anterior to the teres minor and posterior to the teres major. The medial head arises distally from the groove of the radial nerve; from the dorsal (back) surface of the humerus; from the medial intermuscular septum; and its distal part also arises from the lateral intermuscular septum. The medial head is mostly covered by the lateral and long heads, and is only visible distally on the humerus. Each of the three fascicles has its own motorneuron subnucleus in the motor column in the spinal cord. The medial head is formed predominantly by small type I fibers and motor units, the lateral head of large type IIb fibers and motor units and the long head of a mixture of fiber types and motor units. It has been suggested that each fascicle "may be considered an independent muscle with specific functional roles." The fibers converge to a single tendon to insert onto the olecranon process of the ulna (though some research indicates that there may be more than one tendon) and to the posterior wall of the capsule of the elbow joint where bursae (cushion sacks) are often found. Parts of the common tendon radiates into the fascia of the forearm and can almost cover the anconeus muscle. All three heads of the triceps brachii are classically believed to be innervated by the radial nerve. However, a study conducted in 2004 determined that, in 20 cadaveric specimens and 15 surgical dissections on participants, the long head was innervated by a branch of the axillary nerve in all cases. A tendinous arch is frequently the origin of the long head and the tendon of latissimus dorsi. In rare cases, the long head can originate from the lateral margin of the scapula and from the capsule of the shoulder joint. 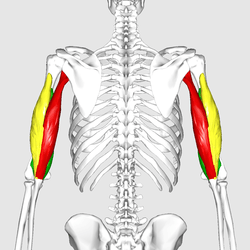 The triceps is an extensor muscle of the elbow joint and an antagonist of the biceps and brachialis muscles. It can also fixate the elbow joint when the forearm and hand are used for fine movements, e.g., when writing. It has been suggested that the long head fascicle is employed when sustained force generation is demanded, or when there is a need for a synergistic control of the shoulder and elbow or both. The lateral head is used for movements requiring occasional high-intensity force, while the medial fascicle enables more precise, low-force movements. The triceps can be worked through either isolation or compound elbow extension movements and can contract statically to keep the arm straightened against resistance. Isolation movements include cable push-downs, lying triceps extensions and arm extensions behind the back. Examples of compound elbow extension include pressing movements like the push up, bench press, close grip bench press (flat, incline or decline), military press and dips. A closer grip targets the triceps more than wider grip movements. Static contraction movements include pullovers, straight-arm pulldowns and bent-over lateral raises, which are also used to build the deltoids and latissimus dorsi. The triceps reflex, elicited by hitting the triceps, is often used to test the function of the nerves of the arm. This tests spinal nerves C7 and C8. It is sometimes called a three-headed muscle (Latin literally three-headed, tri - three, and ceps, from kaput - head), because there are three bundles of muscles, each of different origins, joining together at the elbow. Though a similarly named muscle, the triceps surae, is found on the lower leg, the triceps brachii is commonly called the triceps. 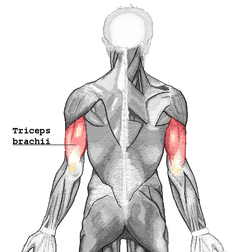 Historically, the plural form of triceps was tricipites, a form not in general use today; instead, triceps is both singular and plural (i.e., when referring to both arms). In the horse, 84%, 15%, and 3% of the total triceps muscle weight correspond to the long, lateral and medial heads, respectively. Many mammals, such as dogs, cattle, and pigs, have a fourth head, the accessory head. It lies between the lateral and medial heads. In humans, the anconeus is sometimes loosely called "the fourth head of the triceps brachii". 1 2 3 4 5 6 Platzer, Werner (2004). Color Atlas of Human Anatomy, Vol. 1: Locomotor System (5th ed.). Thieme. ISBN 3-13-533305-1. 1 2 3 4 Lucas-Osma, AM; Collazos-Castro, JE. (2009). "Compartmentalization in the triceps brachii motoneuron nucleus and its relation to muscle architecture". J Comp Neurol. 516 (3): 226–39. doi:10.1002/cne.22123. PMID 19598170. ↑ See the article "Skeletal striated muscle" for a discussion of type I and type II muscle fibers. ↑ Nigel del a rosa die porte madretis (2006). "Surgical anatomy of the triceps brachii tendon: anatomical study and clinical correlation". Am J Sports Med. 34 (11): 1839–43. doi:10.1177/0363546506288752. PMID 16735585. ↑ Bekler H, Wolfe VM, Rosenwasser MP (2009). "A Cadaveric Study of Ulnar Nerve Innervation of the Medial Head of Triceps Brachii". Clin Orthop Relat Res. 467 (1): 235–238. doi:10.1007/s11999-008-0535-6. PMC 2600974 . PMID 18850256. ↑ Watson, JC; Wilson, AM. (2007). "Muscle architecture of biceps brachii, triceps brachii and supraspinatus in the horse". J Anat. 210 (1): 32–40. doi:10.1111/j.1469-7580.2006.00669.x. PMC 2100266 . PMID 17229281.